The Roy W. Dean Grant for independent filmmakers, awarded by the non-profit From the Heart Productions, celebrates its 25th year by selecting the documentary “Stranger at Home” as its first grant winner of 2017. Awarded 3 times each year, the Roy W. Dean Grant goes to films that are unique and make a contribution to society. “Stranger at Home” will receive $3,500 in cash and $30k in film production related products and services to help it complete production. 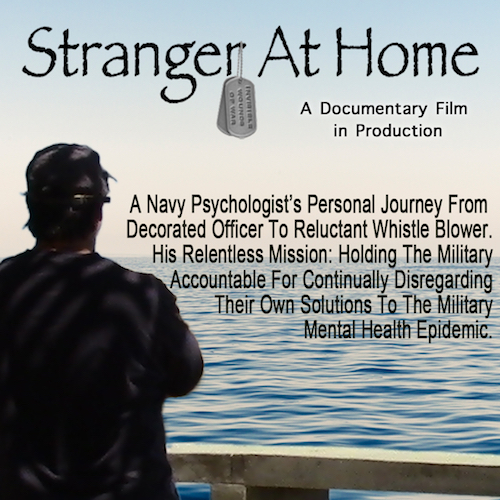 “Stranger at Home” has completed research, development and secondary, photography production. The goal of the filmmakers is to finish production in time to submit to Sundance Film Festival in September of 2018. Through the film, we see the staggering consequences of these archaic and damaging beliefs: 24 suicides to every one battlefield death since 1999, rampant homelessness, substance abuse, incarceration and broken homes. These are all symptoms of untreated war stress Injuries. The film explores the questions of why are we failing our bravest men and women who suffer needlessly? What is being done and what more can we do about it? Why have we let this preventable crisis happen? As winner of the Roy W. Dean Grant, filmmakers receive $3,500 cash given by From the Heart Productions. The winners also receive a hard drive from G-Technology, 40% deduction on color, editing, and sound & all production services from ProMedia, 30% discount in equipment rental from AbelCine Tech, Inc. NYC, Movie Magic Budgeting software as a gift from Entertainment Partners, and much more from many heart-felt donors. Luis, a native of Havana, Cuba, is a graduate of Columbia University where he studied psychology as well as filmmaking under both Andrew Sarris and Milos Forman. Luis has been honored by the Los Angeles City Council for his short film OUT OF ORDER, won an ACE Award of Merit for his bilingual,anti-smoking PSA for the American Lung Association, and his feature-length documentary REGRESO – about the resiliency and inventiveness of people living through the many challenges in today’s Cuba – has screened at festivals and universities worldwide. A graduate of Carnegie-Mellon University School of Drama, Beth has worked on popular situation comedies such as FOLEY SQUARE, VAN DYKE, and LOS BELTRAN an award-winning Spanish language comedy for Sony/Telemundo. Under her own production banner Coyote Pass Productions, Beth has produced award-winning PSAs and short form documentaries. Her feature-length documentary REGRESO premiered at the Santa Barbara International Film Festival and has screened at other festivals and universities worldwide. Sheila has worked in multiple media genres as a producer, director, editor and videographer on such shows as: TALK SOUP, E! TRUE HOLLYWOOD STORIES, as well as the OSCARS, EMMYS, and the GOLDEN GLOBES. She’s also worked as an editor for Tribune/KTLA News and Special Projects where she won awards from the Greater Los Angeles Press Club as well as a TELLY. She has worked on other documentaries such as: OUR STORY, KIDS GET CANCER TOO - SEEING IS BELIEVING; THE INSPIRING STORY OF RWANDA – AHE PASSION TO PLAY, ONE PLAYER’S STORY and SINGING FUNNY. Now in its 25th year, the Roy W. Dean Grant has awarded over $2,000,000 in cash and donated film services to films. The grant has been an important lifeline for filmmakers needing help to continue working on their film and to get it completed. Without assistance from the grant, many excellent and important films may never have been made. Past winners of the grant that have been completed include the Emmy winning "Mia: A Dancer’s Journey", the SXSW Best of Fest Music Film "The Winding Stream: An Oral History of the Carter and Cash Family", and the now in release on video and on demand the very relevant "The Brainwashing of My Dad".